Best Foods Professional Cooking Mayo is designed to delivery the superior results for high heat cooking techniques such as baking, stir-frying and deep frying. Even when heated up to 200°C, it retains its stability without oil separation and maintains its good colour and texture while enhancing the taste of the dish. 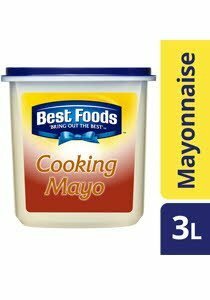 Best Foods Professional Cooking Mayo, the chefs' choice for hot applications! May contain traces of cereals containing gluten, soy, fish, milk and celery. Keep in cool & dry place. After opening, keep refrigerated at 4-10℃. Do not freeze.